It's hard to believe we've reached the final month of the year. Fall flew by way too fast--it was all just a blur, really. From August to late November, work kept me moving at a steady pace. For those of you who don't know, a big of my job is to oversee the production of all the marketing and advertising content that goes into hiring Amazon.com's seasonal workers, so they can pick, pack, and ship all of your holiday orders. As you can imagine, this is quite a feat! We're starting to wind down now, so I'm beginning to shift my focus back to all things knitting. Somehow through all the chaos, I've started to combine my love of knitting with my passion for marketing and branding. 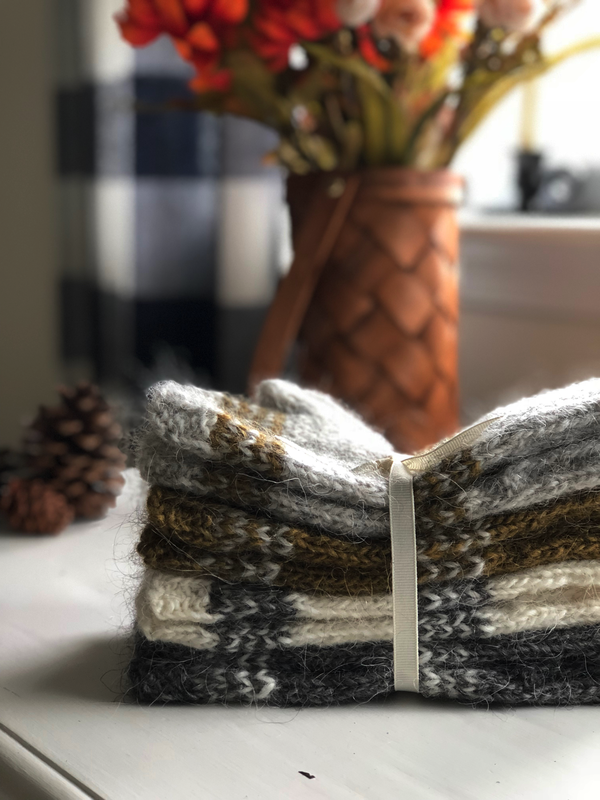 I released my very first pattern for sale, The Giving Mitts, which was both extremely nerve-wracking and exciting. After dozens of hours fretting over making sure every detail was perfect, pushing the 'publish to Ravelry' button felt exhilarating! The #knitstagram community has been so supportive and it's been so much fun seeing everyone's posts. I also sent in two design submissions--a pair of lace socks to The Fibre Co.'s YSP 2 collection, and a worsted-weight cowl to Quince & Co.'s Scarves, etc. 7. The Fibre Co. ended up passing on my design, but I really enjoyed the whole process of coming up with the design concept, knitting a prototype, and branding the submission PDF. Actually, if I'm being honest, while I love the challenge of knitwear design, the best part of a submission is the pattern branding. I have so much fun staging the photos, setting the PDF layouts, choosing the fonts, writing the copy, and sharing glimpses on social media. All of this, I hope, is good practice for down the road. My son graduates high school next year, so the question of what's next has been a common theme around our home. Lately, we've been obsessively looking at real estate in Maine and are seriously considering a move up North. It would be a dream to move to small, coastal town and provide marketing support to a fiber company. In January, we're thinking about heading Down East to check out some of the small towns we've been researching. We hope that seeing them in winter will provide us with a realistic view of what it might be like to live there. If you have any suggestions on where to look, I'd love to hear them!